Forensic science technicians work with law enforcement to analyze evidence and investigate crimes. While crime scene investigators and other law enforcement professionals actually visit crime scenes and collect evidence, forensic science technicians—also referred to as forensic scientists—work mostly in a laboratory setting analyzing that evidence. The evidence gathered from crime scenes may include fingerprints, blood, hair, bullet fragments, photographs, and more. While forensic science technicians should have a working knowledge of law enforcement, their background typically is in biology, chemistry, and other scientific fields. Forensic science technicians do their work in a laboratory setting for the most part. Police and crime scene investigators gather evidence that they bring to forensic science technicians to have analyzed. 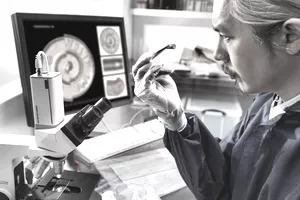 Because of the nature of the work, forensic science technicians need to be detail-oriented and organized, making sure evidence is in no way tainted or mishandled in any way that can raise questions about its validity. It sometimes is necessary for forensic science technicians to testify in court about their findings in order to explain them in a way that a judge or jury can understand. They may even have to defend their methodology or conclusions. Salaries for forensic science technicians can vary widely depending on where they work, as well as how much experience they have. A strong background in science is necessary to become a forensic science technician. A degree in forensic science is preferable as a starting point for this career, but degrees in biology, chemistry, or other related fields also can serve as entry points to becoming a forensic science technician. A broad range of classwork will be beneficial as training for the job, and professionals who obtain advanced degrees in relevant sciences may advance further in the profession. Biology: A broad knowledge of biology is necessary, including microbiology, molecular biology, and cell biology. Chemistry: A strong foundation in chemistry also is necessary, especially in the areas of biochemistry and organic chemistry. Forensic Pathology: Even schools that do not offer degree programs in forensic science often offer courses specific to the field. Other Relevant Courses: Students also should study genetics, toxicology, calculus, statistics, and criminology courses to help build a strong foundation for getting into a career as a forensic science technician. Communication: Forensic science technicians must have excellent speaking and writing skills in order to share information with colleagues and present findings in court. They also need to collaborate well with crime scene investigators and other law enforcement officers. : Using scientific methods to solve problems and connect different puzzle pieces from a crime scene is the bulk of the job. Rarely will conclusions be obvious, and forensic science technicians need to work through evidence meticulously. : Forensic science technicians need to question everything and eliminate all other possibilities before reaching conclusions. Attention to Detail: Examining evidence requires the ability to notice minute details and subtle differences. As well, the handling and cataloging of evidence must be done following precise procedures so no evidence can be questioned due to it being mishandled. Increases in technology and the reliability of forensic evidence is expected to increase demand for forensic science technicians, and the U.S. Bureau of Labor Statistics projects about 17 percent job growth in the field for the decade ending in 2026. This is more than twice the rate of growth projected for all jobs combined. Forensic science technicians work mostly in a lab setting analyzing evidence collected by investigators. Forensic science technicians need to have a good rapport with crime scene investigators and other law enforcement officers who gather evidence. It's not uncommon for forensic science technicians to be called to testify as witnesses in criminal cases in order to explain their findings. In addition to working in police laboratories, forensic science technicians might work with coroners or in morgues. Hours tend to be standard business hours, but there can be times when work needs to be expedited, resulting in evening or weekend hours. It's important to have a passion for science and research. An undergraduate degree in forensic science is not always mandatory, but it is helpful. Seek internships or lab assistant positions in police laboratories, coroners' offices, or other similar settings.